Below are answers to frequently-asked questions during our admissions process. The City of West Hollywood contracts with the Los Angeles County Sheriff’s Department for police protection. To reach the West Hollywood Sheriff’s Station, dial (310) 855-8850. Click here for more information about the Los Angeles County Sheriff’s Department. The WeHo Public Safety Department provides oversight of law enforcement and coordinates community programs to reduce crime and increase public safety and the quality of life for citizens, businesses and visitors to West Hollywood. The Director of Public Safety is Kristin Cook (323) 848-6414. City of West Hollywood (Homepage). 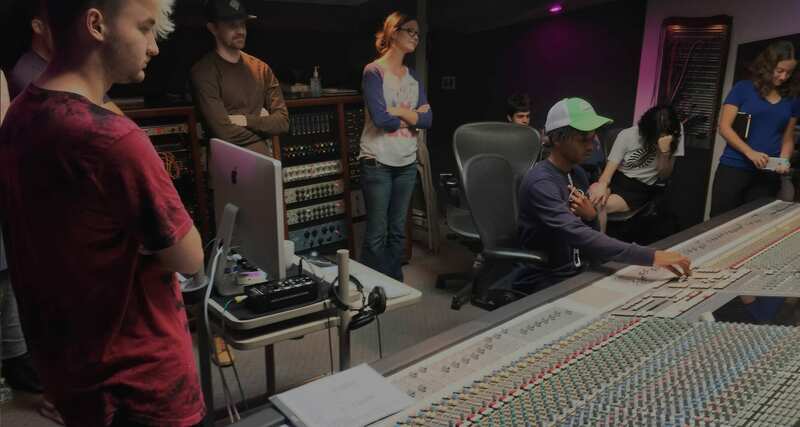 Individual music production courses are between two and three weeks in length (course-dependent). Part-time courses include class two nights a week, while full-time courses have class five days a week. A series of four part-time courses is ten weeks in length. Four full-time courses runs five weeks. No, we do not currently offer online courses. We believe in creating a supervised, focused learning environment in order to fully support our student-producers while they are developing their craft. What should be my estimated budget for housing? Crē•8 Music Academy does not provide on-campus housing. Airbnb is a trusted community marketplace for people to list, discover and book unique accommodations around the world. Searching our address reveals private rooms and apartments between $50-$150 per day. Banana Bungalow West Hollywood provides the budget international adventurer with hostel accommodations in a friendly and socially interactive atmosphere. What should be my estimated budget for living expenses? Living expense budget considerations should include food, transportation and entertainment. This will vary according to individual preference and course duration. Crē•8 Music Academy does not accept FAFSA or any sort of federal financial aid. However, credit and payment options may be available and are treated on a case-by-case basis. Please contact our highly trained admissions department for more information. A laptop is not required in order to register or complete our courses. Our on-campus lab and studio provide all of the required software and hardware. A laptop comes in handy for downloading handouts, managing files, viewing slide presentations during projects and submitting projects. What is the best type of hard drive for me to purchase? We recommend a USB-powered, solid state G-Drive. 500GB is more than enough storage to complete any course(s). However, any USB-powered external drive between 320GB and 1TB in storage is acceptable. How can I take advantage of the multi-course discount? In order to receive an $800 multi-course discount, four-course tuition must be paid in full. Tuition discount applies specifically to the fourth course in a series (Initi•8, Activ•8, Stimul•8 or Liber•8). The first three courses are priced as normal ($1,500). Total tuition for the fourth course is $700. Withdrawal from any remaining course(s) in the series will void the multi-course discount and result in a pro-rated refund. This multi-course discount is effective as of August 1st, 2018. What materials should I bring to class? Nothing is required during class other than your attention! Many of our student-producers opt to bring a notepad to jot down questions, ideas and comments during class. While on campus, it’s a good idea to have your external hard drive and laptop (if applicable). Will I have studio access outside of class? Yes, the lab and studio can be booked any time during our normal business hours. We accept applicants from all backgrounds, including newcomers and professionals. Our courses are structured to add efficient, dynamic layers to music production processes. Experienced individuals are able to fine-tune their operations, while newcomers are able to learn best practices and workflow right away. How should I prepare for my course(s)? The answer to this question will vary, depending on individual experience and in which course(s) you are enrolled. Please speak with one of our highly-trained admissions representatives for further information. Do you offer a student VISA? Crē•8 Music Academy does not participate in the Student and Exchange Visitor Information System (SEVIS) and does not sponsor or provide a VISA. Any course(s) can be completed on a tourist VISA. Do you offer GI/VA assistance? Crē•8 Music Academy provides a 15% discount to our veterans (with military ID). Thank you for your service and welcome home. How can I make money using music production skills? Music production skills can be monetized in several ways. Developing skills at different stages of the production timeline can yield an “a la carte” approach to session work, while simultaneously developing enough experience to oversee a record from start to finish. Steps among the stages of production are operating a DAW during recording sessions, arranging, orchestrating, vocal production, vocal comping and tuning, sound & synth design, mixing and mastering. Producers with exceptional skills in any of these stages can be contracted to perform their services during the production process. After experience and skills have been gained throughout each stage of production, an ascending producer will be trusted with a retainer (budget) to oversee the delivery of a master recording… from scratch. At this stage in a producer’s career arc, this will often be what is referred to as an “all-in” budget. An all-in budget is an agreement between the producer and the financier (independent artist, independent record label or major record label), which states that the producer is in charge of overseeing the song or project from start to finish after being provided a lump sum by the financier. The producer is allowed to keep whatever they do not spend, but is expected to deliver a high-quality master recording. Our courses are designed to prepare aspiring producers to accept an all-in budget with confidence. Each course focuses on a different area of the production timeline, while building fundamental skills, foundational knowledge and professional habits. Student-producers are able to identify their areas of strength and weakness during their course(s). After graduation, they may begin monetizing their strengths immediately, while practicing their areas of weakness so they are prepared to capitalize on any opportunity. This Privacy Notice discloses the privacy practices for www.Cre8MusicAcademy.com. We are the sole owners of the information collected on this site. We only collect information that you voluntarily provide. We will not sell or rent this information to anyone. We will use your information for response purposes. We will not share your information with any third party outside of our organization. Unless specifically declined, we may contact you via email or phone in the future with information regarding specials, new products and/or services. Express any concern regarding our use of your data. Only employees who need the information to perform a specific task (such as billing or customer service) are granted access to personally identifiable information. The computers/servers in which we store personally identifiable information are kept in a secure environment. Active artist, producer and entrepreneur, Pete Hopkins is currently writing and recording with his original rock/pop band Get Back VAL. He has recorded the debut single with GRAMMY award winning engineer Rob Burrell and is receiving A&R attention from major record labels.